The Ministry of Foreign Affairs in Bangkok have confirmed that tourist visa fees will be reinstated as of March 5, 2010. Thailand’s tourist visa fee’s were removed last year in a bid to revive travel and tourism to the kingdom. Since June 25, 2009 all tourist visa’s from anywhere in the world were free and will remain free until March 4, 2010. Apparently the Foreign affairs Ministry, who oversee the Royal Thai Embassies and Consulates worldwide, believe that Thailand tourism in 2010 will be booming, or at least that is the hope. While there has been some grumbling across the net due to this news you can hardly blame the ministry as they said last year this would only last until March of 2010. Apparently some people can’t get over the fact that they will once again have to pay the princely sum of $35 to enter the country again on a tourist visa. The Thailand tourist visa allows for a maximum stay of 60 days with extensions available at local immigration offices. Australia, Austria, Belgium, *Brazil, Bahrain, Brunei Darussalam, Canada, Chili, Denmark, Finland, France, Germany, Qatar, Greece, Hong Kong, Iceland, Indonesia, Ireland, Israel,. Italy, Japan, Kenya, Republic of Korea, Kuwait, Lao, Luxembourg, Macao, Malaysia, Monaco (effective 26 Oct 07), Netherlands, New Zealand, Norway, Peru, Philippines, Portugal, Singapore, South Africa, Spain, Sweden, Switzerland, Turkey, U.A.E., U.K., U.S.A., Vietnam. Bhutan, China (including Taiwan), Czech Republic, Cyprus, Estonia, Hungary, India, Kazakhstan, Latvia, Liechtenstein, Lithuania, Maldives, Mauritius, Oman, *Peru, Poland, Russian Federation, Saudi Arabia, Slovakia, Slovenia, Ukraine. If you are not a passport holder of the above countries or you are going to go Thailand for other purposes than tourism, you need a visa. More info can be found in the Thai Visa section. Odd to see Poland on two week visas. I guess they do not have an extended agreement with Thailand? Or maybe they are too busy populating the UK to pay attention to LOS? 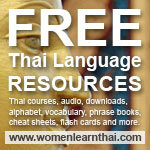 .-= Catherine´s last blog ..A Thai Learning Thai =-. Talen, before living two years in France I bought into the whole French men are the sexist ploy. But when I worked with a Polish team (oil exploration)… Wow. I’ve been chased fast and furious by French men (and not just in France). Talen since we seem to be talking countries I wonder why Tunisia is Visa exempt? The others are ASEAN so an obvious link. perhaps Thais like dates? They have also started enforcing the fine for even a single days overstay, which was being waived, however a friendly smile and exit stamp was usually followed by a request for some “tea money”. I am on my 8th 30 days visa since last August and not once has anyone asked me for ticket or proof otherwise of departure from Thailand. Lloyd, Not surprising on the overstay fee considering how many have been doing it and for more than a few days. I haven’t heard of anyone being asked for proof of departure but technically it’s required when entering the country…but this is Thailand. It would be nice to see some visa rules relaxed this year especially if they want to see tourism rise but I’m betting on even more restrictions in the future. That’s a good question Mike…maybe there is a Tunisian reader out there somewhere among all of our blogs that can shed some light. Talen if someone’s going to Thailand for a half decent stay then 35 dollars is little when compared to what you can save on accommodation and food alone. Thailand stated the free visa would only be until March 2010 and so I can’t see any reason for anyone to complain. I’d willingly had over the money if I could get 60 days off work. .-= Martyn´s last blog ..Nightmare Flights =-. Martyn, it really is a small fee to pay for paradise…Now, if I could only find someone to pay me to go to Thailand then life would be perfect. When I move to LOS later this year, my one-year non-imm O-A visa will cost $175, multi-entry. And only have to do 90-day reports — don’t have to leave kingdom. Not so bad really, although these 90-day reports are a pain. .-= SiamRick´s last blog ..Film on Burmese monks’ protest an Oscar nominee =-. Oh, forgot to add, someone actually will pay me to go to Thailand. Starting late this year. Sorry. Rick, all in all still not too bad for a longer stay in the place we love. The 90 day reporting can be a pain unless you are close to the immigration office. When I do make the move to Nakhon Phanom the off ice is right there on the Mekong across from the port…and the ladies there are super nice. I’d love to find someone to pay me to live in Thailand but that might be a tall order. .-= SiamRick´s last blog ..Musings on friendship bridges and rush to build them =-. Rick, Yes that is the same exact office. Very easy and convenient and if you are short on cash the pawn shop is right next door. The times I have been to the immigration office in NP there have only been 1 or 2 other people there and a few Lao nationals hanging out outside waiting. Also, if you live in NP you can get a special card from immigration to cross on the ferry. They have to do some paperwork and you have to prove you have a NP address and after that they send it to Laos to ok. Once done you get a card similar to a license that you show to cross. If I remember right the cost is around 3000 baht but I’m not sure how long the card is good for.